This is What Remains of a Shattered Mental Health System in Newtown. Could it Have Helped Adam Lanza? I wrote in a previous post about what life was like growing up in Newtown, Connecticut. It truly is a picturesque New England town. But what might be surprising is that within that town sat a gem. A hundred acres of wooded rolling hills within which sat an inner campus of professionally landscaped and meticulously manicured grounds crowned with stately and handsome brick buildings in a colonial architectural style. These were the grounds of Fairfield Hills Hospital, a state run mental health facility located in Newtown, about 3 miles from Sandy Hook Elementary School. The hospital closed its doors in 1995. To tell the tale of Fairfield Hills Hospital is to tell a tale of two nations. The first, a new economic and financial superpower, a country with an increasingly aspirational middle class toiling in a system that rewarded their hard work with a level of wealth and a standard of living never seen before in human history. The second, a country struggling to balance the opposing pressures of a demographic bubble and crushing debt levels the likes of which have also never been seen in human history. The groundwork for the facility was laid in the former era. This was a time of great social upheaval, public works, social consciousness and most importantly, a government that was willing and able to fund big ideas. It was a period that saw the birth of Social Security, Medicare, and several of America’s grandest public works projects. The grounds of the Fairfield Hills Hospital campus included 16 buildings gathered centrally in a large rural campus. At its height, Fairfield Hills Hospital housed more than 4000 patients and had its own residency training program in psychiatry. The facility included 600 acres of land accessible to the public. It also had a dedicated cafeteria building, movie theater, tennis court, soccer field, baseball diamond, gymnasium, laundry, and staff housing facilities. It even had its own self contained power plant and water treatment facilities. But most importantly, it had a large inpatient psychiatric facility. Many of the patients were temporary and often involuntary residents. But many others were long term residents. Very often they were mentally handicapped wards of the state, who could not live independently and had no one to take care of them. Others were severely mentally handicapped or individuals who represented a threat to themselves or others. For these people Fairfield Hills Hospital, and similar state run mental health facilities around Connecticut, became their homes. Many of patients, who did not need to be confined all of the time, were allowed to walk around the campus and use the facilities. Some that were deemed able, took basic jobs around the campus and were given a small stipend. It was extremely unusual for patients to leave because, well. . . where would they go? They had nobody else that would take them in. 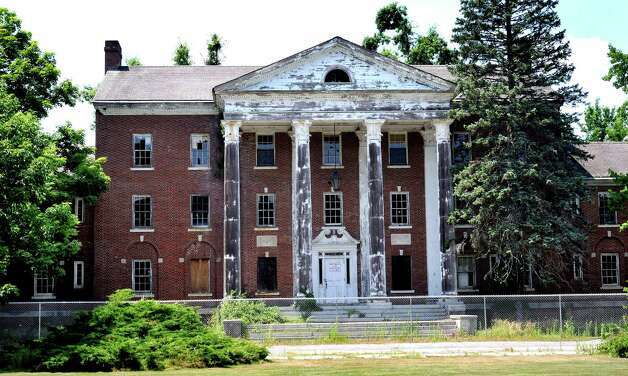 What subsequently happened to Fairfield Hills Hospital is largely emblematic of what had befallen mental health care and in another sense, public funding in America. The soaring expenditures of maintaining grand inpatient mental health facilities, and maintaining thousands of employee benefits including generous health care and pensions became increasingly difficult to continue in the face of a decreasing tax base. This coincided with the decreasing emphasis on institutionalization and greater emphasis on community based models of care . It was hoped that transitioning these patients to outpatient psychiatric care would help return them to society much faster with the addition of being much less expensive than maintaining inpatient campus facilities. For the most part it was at least partially successful. Many people did transition to the community, and some that could not live on their own could be placed in adult foster care or temporarily in so called “half-way houses” and receive outpatient psychiatric services. Many more however did not fare well. Some completed therapy, but could never become functioning members of society. For many of those people, there was simply no way that they could adapt to outpatient care without a greater degree of family or community support. For these people, the controlled environment of an inpatient facility was the only thing between them and life on the street. This unfortunately has proved only too true; many of Fairfield Hills Hospital’s former patients have been witnessed as one of many faceless homeless people now roaming the cold streets of Connecticut’s cities rather than the manicured pathways of the campus they used to know. Others who were unable to make the transition simply traded one institution for another. Their repeat criminal offenses earned them time behind bars of a wholly different type of facility, where it would be unlikely that they would ever get the treatment or support that they need. This of course makes it very unlikely that they would ever be able to stay out of prison for very long. This latter situation calls to mind the case of Liza Long, whose adolescent son’s violent tendencies make her concerned about her families’ safety. After her son was temporarily committed, she was advised that there was little that could be done to help her until a crime is committed. For such people and for those with chronic debilitating mental diseases, a facility like Fairfield Hills Hospital might be helpful. Liza Long referred to her predicament in the title of her post “I am Adam Lanza’s Mother”. In many ways, Fairfield Hills Hospital could well have been Adam Lanza’s mental health facility. Previous PostPrevious Sandy Hook Elementary, Where I Chipped My Tooth on the Jungle Gym. Next PostNext Should a Medical College Dean Take Money from Pharma?